I absolutely love this photo I took of Lauren and Mitch during their bridal portraits. When I visited the venue with them both prior to their wedding day we scouted out different locations for the formal photographs. The trees framed the newlyweds perfectly. 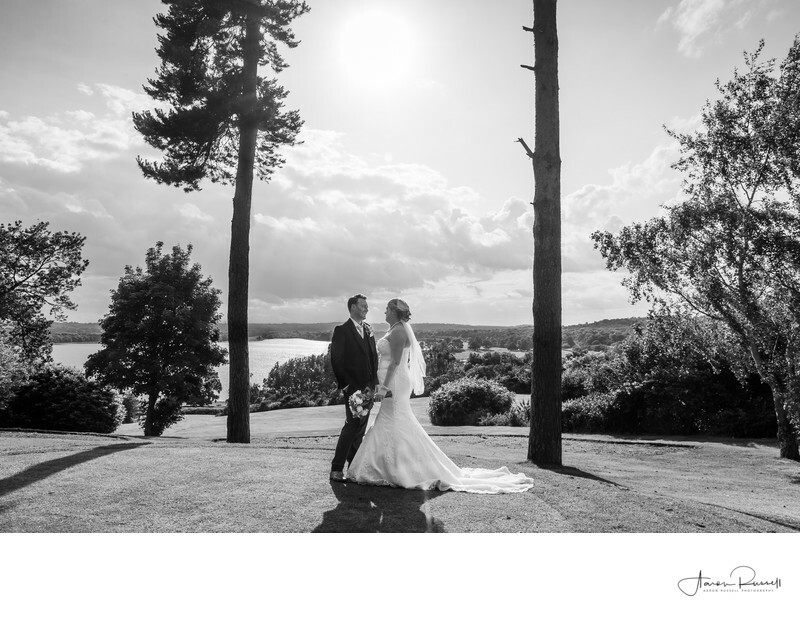 With Rutland water as the backdrop and the sun high in the sky, I just knew I would create an incredible photograph for them both on their wedding day! With the sun being up high and behind them it created a beautiful rim light around the couple and really helped to show the details in her gorgeous wedding dress. The only problem to overcome was how to light them both so that they didn't just become a silhouette. It was an easy problem for me to resolve though as I use Profoto Strobes. These are incredible flashes that have enough power to allow me to be ultra creative quickly and consistently. You can read more about my Profoto lighting equipment here. Being able to control the professional studio strobes from my camera remotely it allows the couple to enjoy their time together away from the guests knowing that they will be back with them quickly to enjoy the celebrations. The final piece of the jigsaw though with this photograph was my editing style. When you take a photograph as a professional photographer you know in your head which photographs will work well in Black and White. This was one of those moments that I knew the very moment I looked at the scene all those months before their BIG day!